The Chevy Camaro has a long, rich history when it comes to American sports cars. The first Chevy Camaro was introduced on September 29, 1966 for the 1967 model year. The goal was to compete with another longstanding sports car favorite, the Ford Mustang. Since its inception, there have been a total of six generations of the Camaro. If you are looking to protect your prized possession, you are in luck. 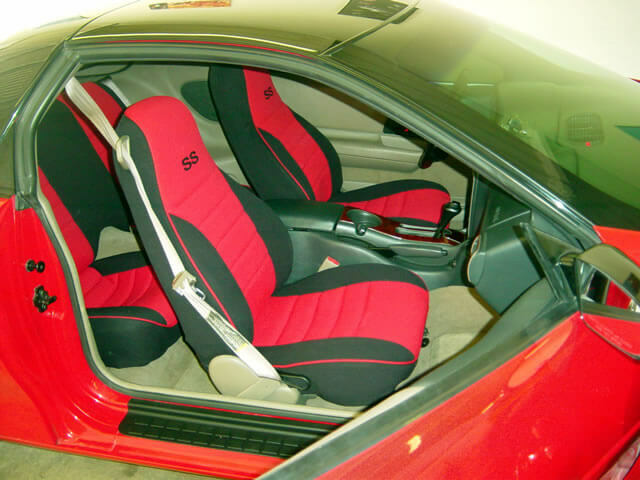 We carry car seat covers for virtually every Camaro in existence and have enough options to match every Camaro owner’s style. We carry twenty-four standard color car seat covers which are two-tone car seat covers with the outside color being black. We also carry seven full-piping seat colors with piping in any color. Our half piping seat covers are two-tone where the piping color will always match the interior color. If you are looking for car seat covers to really set you Camaro apart, we offer Realtree seat covers for the avid hunter. There are five options of camouflage to make your sports car just as ready for hunting season as you are. For a completely different feel, you can deck your car seat color out in a floral pattern, leopard pattern, or military camo in ocean, sand, and green varieties. You can also get your car seat cover ready for a luau with any number of Hawaiian themed patterns. Regardless of your preference in style, your Camaro deserves to be protected. Our car seat covers provide protection from dirt, crumbs, other particles, water, and the sun’s UV rays. All of these different elements can cause harmful damage to your car seats. Without our neoprene car seat covers your car seats could tear due to sharp micro-particles, form mold due to absorbed water, or fade due to the sun’s UV rays. The sun also has the ability to dry out leather seats causing them to fade and crack. Do yourself and your Camaro a favor and head over to WetOkole.com and pick up your car seat cover.